Upon entering the Loews Jersey Theater, in the middle of the summer, when they do not host events, the first thing you’ll notice is the heat—there is no air conditioning. The second thing: a mustiness—the impressive, Baroque-style theater built in 1929, has humidity control issues from the years of neglect before it was revived, and suffers from trapped air. All of this, you then realize, is sad, because perhaps you’ve seen a concert there in the past—like the recent Neutral Milk Hotel or Sufjan Stevens—and wondered why, while marveling at the space, they don’t host bands every week. The answer: with 1000 non-usable seats in the balcony, many promoters tend to back away, as it means lower ticket sales. A fire marshall must also be present because the building is not completely up to code yet. 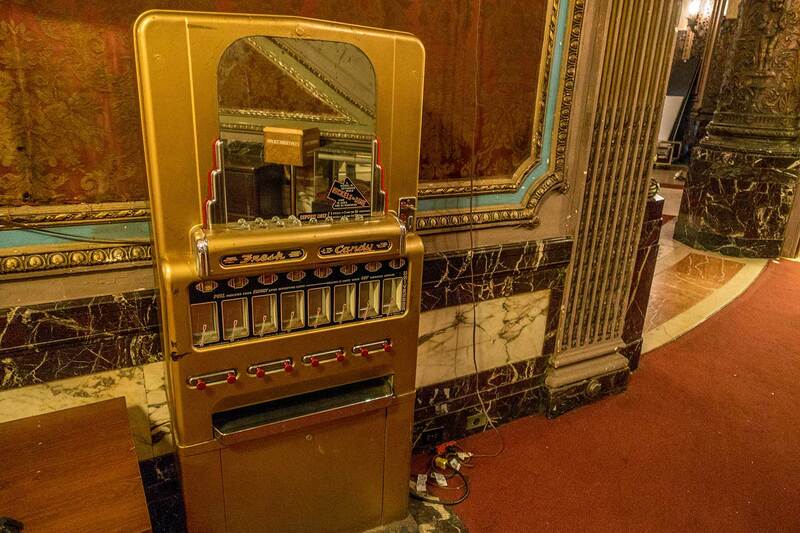 “There is so much left to do to make it fully functional,” said Colin Egan, co-director of Friends of the Loews, the non-profit organization that rescued the theater from being torn down in 1987, after it was left as an abandoned triplex cinema in 1986. “But we are getting more bookings the more repairs we do,” he claims. Air conditioning, which was supposed to happen years ago, he estimates, would now cost $1.5 million. 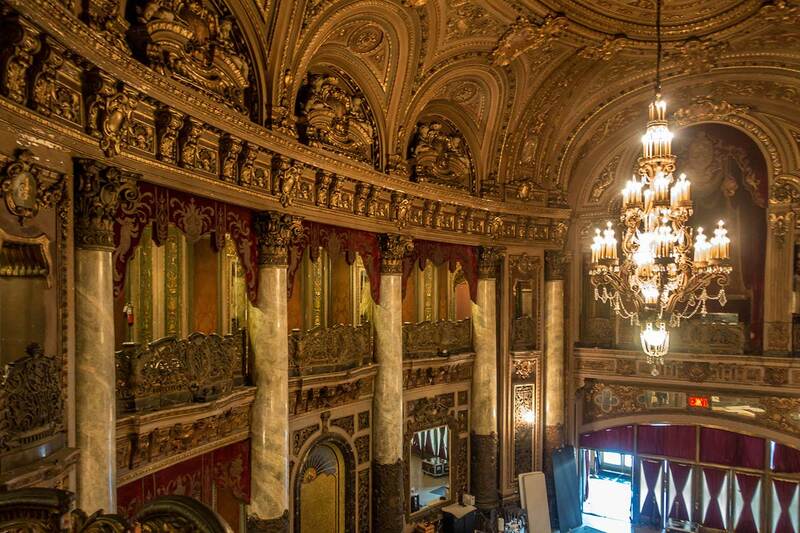 The question of why the Loew’s has been unable to undergo a Kings Theater (Brooklyn) style full renovation under the Fulop administration (or prior administrations) and become a cultural destination with more jobs and year-round programming, is a complex one. First, you will have to deal with the Friends of Loews. And that will result in a long conversation. “We are always hoping we can reach an agreement with the city. We’ve done a heck of a lot more than save the building,” said FOL founder Pattie Giordan. In 1993 the city bought the theater and FOL signed a lease to continue to preserve it. Giordan and Egan, are the foster parents who kept it on life support through grassroots organizing for restoration, massive cleaning and refurbishing. While the city pays for utilities, money made from events goes into salaries (Egan and Giordan make $45,000 each), insurance, operations and slow and steady repairs. They have taken on larger projects like repairing the ceiling and orchestra seats funded through grants and small donors. Eventually, studio-grade projectors were brought in and The Garden State Theatre Organ Society replaced the missing original pipe organ with a sister organ and restored it. “A common misconception is that nothing has changed. This was in ruins when we came on board,” Egan said. In February 2014, after informing FOL they were not entitled to their lease anymore, the Fulop administration announced that AEG Live would manage the Loew’s, and spend up to $40 million to overhaul the theater. The city had also received bids from LiveNation and the New Jersey Performing Arts Center. But in May 2015, a judge ruled that the FOL’s lease was indeed valid and that the city cannot break it, putting a halt on Fulop’s plans, a plan that if executed successfully, would be a highlight of his Mayoral legacy. For now, that would mean somehow compromising. In the Fall, Egan hopes to begin to address pipes and ventilation, with the grant money no longer being withheld by the city. Egan and Giordan, who have never brought in an outside artistic director, are strongly opposed to what they believe would happen if AEG bought it: it would become about pop music. With a nonprofit controlling programming, Egan believes, “You can have diversity, appeal to local interest and still be affordable. With AEG, you’ll just have commercial pop,” he said. The threat of a company like AEG would mean a squashing of what they feel they’ve built. Instead, they want more money from the city to make more repairs and to stay in charge of programming themselves. Stage Fest, The Golden Door Film Festival, dance performances, graduations, community events, film shoots (renting for up to $3,000 a day) and weddings (10-12 per year), TEDX, as well as events with WORD bookstore (recently, a sold-out Stephen King End of Watch book tour launch, and a Nick Offerman reading/book signing) are some of the broader events the theater hosts, as well as film screenings and a few concerts a year through promoters like Bowery Presents. Ultimately, muses Egan, they look to a theater like Red Bank’s Count Basie, as an emblem of what they want to be: a dually functional theater with support from the local government. For now, anyway, AEG is off the table while their lease is in effect. “Another misconception about us,” said Egan, “is we are little guys.” But the space would not be there if it weren’t for them, and it’s a nearly 30-year relationship that has to be acknowledged in all discussions regarding the theater’s future. “Be careful what you wish for. Because we have never quite lost,” said Egan. —September 28, 1929—Loew’s Jersey opened as one of five “Loew’s Wonder Theatres” in the NYC area. At the time, Journal Square is a popular entertainment/shopping destination. It cost $ 2 million to build. Admission is $0.35 for live entertainment and film. —1929-1960s— Popular vaudeville acts draw patrons to fill nearly 3000 seats. The Robert Morton “Wonder Morton” pipe organ is part of performances. —1974—The Loew’s Corporation had the theatre subdivided into three smaller theaters showing films. —August 1986—The theater closes. The final film shown: Friday the 13th Part VI: Jason Lives. —1987—The Loew’s Corporation sold the theatre to Hartz Mountain, who planned to demolish it. 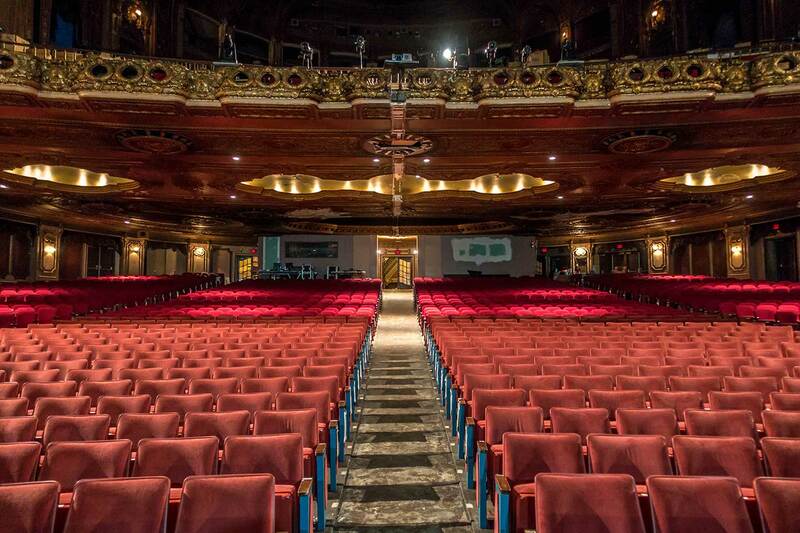 Friends of the Loews is founded with the purpose to preserve the theater. —1987-1996—the theater remains closed as FOL makes repairs. —May 2015— a judge rules that the FOL’s lease is valid and that the city cannot break it. —July 2016 FOL wins back 300K grant previously retracted by Fulop Administration. Wow what an amazing building, so glad it was saved! makes you wonder what other beautiful, historic buildings were destroyed. I wonder the same thing when I ride down Summit Ave or Bergen Ave and what that area must have looked like at some point, lined with row houses, brownstones, and Victorians before it was turned into what it is now (what I refer to as vinyl hell). You still see small portions that have the historic charm like the 5-6 brownstones on Summit Ave near Montgomery, I can only imagine the entire street looked like that at some point from JSQ to Communipaw..so sad. This article is heavily biased toward the Fulop administration’s version of the story, with nothing about the twenty years between 1993 and 2014 with the city saying that it would support the Loews and then failing to follow through, until the current administration could step in with a corporate “solution”. Anyone who wants to hear more of the FOL side should check out their FAQ. It’s possible that both sides have been loathe to compromise, but instead of making the two leaders of FOL sound selfish (and ignoring the many volunteers who have put in hours and sweat to make the Loews a great part of the JC community), the writer here could have provided a more balanced story.